Mountain Empire is one of the newest of more than 100 independent PACE organizations across the nation that serve both as health plans and as medical and long-term service providers to elders—offering meals, checkups, rehabilitation services, home visits, and many other supports that enable enrollees to preserve their independence. The model for PACE dates back to 1971, when a public health dentist and social worker from the San Francisco Public Health Department working in Chinatown-North Beach noticed that as their clients aged, many needed extra support but dreaded moving into nursing homes. They founded On Lok Senior Health Services as an alternative to institutional care that would allow elders to "age in place" in their homes; on lokis Cantonese for "peaceful, happy abode." On Lok's founders were particularly concerned about elderly clients who suffered when their various clinicians failed to work together, sometimes leading to complications that necessitated moves into institutional care. They designed On Lok to promote what was then an innovative approach: coordinating care from an interdisciplinary team of professionals who provide all primary care services and oversee specialists' services. A Medicare-funded demonstration spanning 1979 to 1983 found this approach had many benefits. Care teams were able to prevent or quickly address problems, resulting in better health and quality of life and producing 15 percent lower costs than traditional Medicare. In the decades since, the model has spread slowly, though enrollment has grown nearly 40 percent in the past three years. 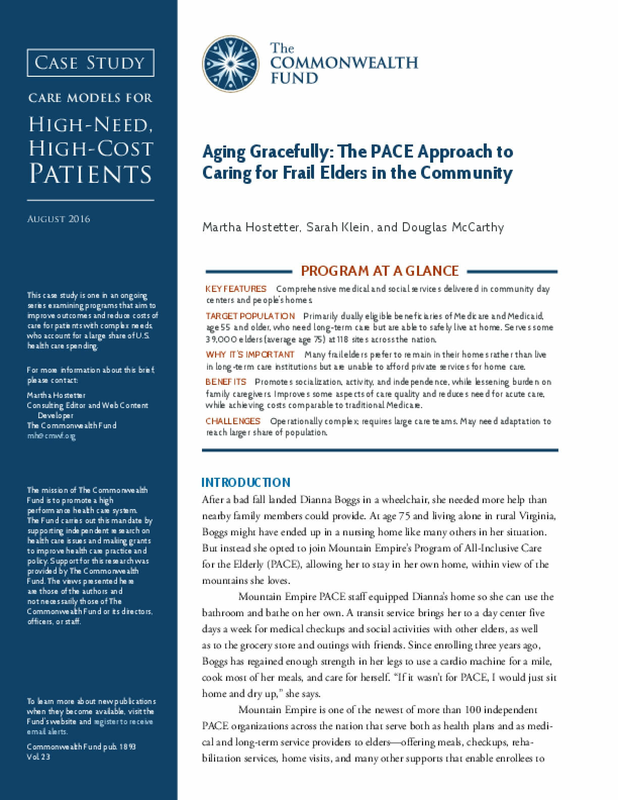 As of January 2016, there were 118 PACE organizations in 31 states serving some 39,000 elders.